You can enroll your contacts in a sequence from the sequence summary page, from a contact record, or from your email inbox. When enrolling contacts in a sequence, make sure you follow email sending best practices. 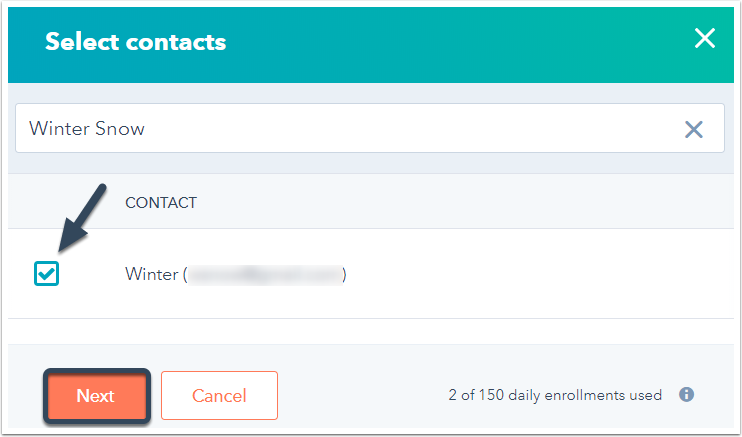 You can enroll a single contact in a sequence or if you are a Sales Hub Professional or Enterprise user, you can enroll multiple contacts in a sequence using sequence queues. Please note: users can initiate up to 150 sequence enrollments per day. This count resets at midnight UTC. This limit is put in place to ensure no user hits their email provider's sending limit, and is based on the sending limit for G Suite (formerly Google Apps), which limits users to 2,000 email sends per day. HubSpot will not be able to increase the limit of sequence enrollments. Click the name of the sequence. If you are a Sales Hub Starter or Service Hub user, in the upper right, click Enroll. If you are Sales Hub Professional or Enterprise user, in the upper right, click the Enroll dropdown menu and select Enroll a single contact. Search for the contact you want to enroll and select the checkbox next to their name. Please note: if you have templates that contain curly brackets in your sequence, enrolling a contact in a sequence will result in a continuous loading screen. Remove any curly brackets from your template and then re-enroll the contact. In the Enroll Sequence dialog box, set up your sequence settings and personalize the templates. At the bottom of an email template, use the rich text toolbar to format the text or insert a link, snippet, or document. If you're a Sales Hub Professional or Enterprise user, you can use sales email recommendations and surface insights about your contact to help tailor your email content. Click the Get suggestions alert to review the recommendations. At the top, click the Start at dropdown menu and select the step to execute first in the sequence. Click the Time zone dropdown menu and select a timezone. Send follow-ups at manually set time: specify a send time for each email in your sequence. To manually set the send time, use the dropdown menus above each email in the sequence. 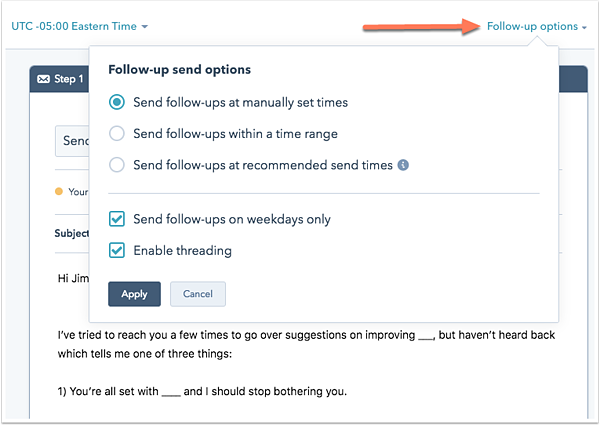 Send follow-ups within a time range: click the dropdown menus to set a time range for each follow-up email to execute in the sequence. Send follow-ups at recommended send times (Sales Hub Professional or Enterprise only): follow-up emails will be sent at a time with the highest open rate for that day. This time is determined by HubSpot. In the same window, you can select the Send follow-ups on weekdays only checkbox to ensure emails are only sent on weekdays. You can also select the Enable threading checkbox to ensure any subsequent emails will thread with the initial email. These settings will override the sequence's default settings. When you're done editing your follow-up options, click Apply. If you don't want the first email in the sequence to send immediately, click the dropdown menu on Step 1 and select Send first email at a specific time, then click the dropdown menus to pick a date and time. 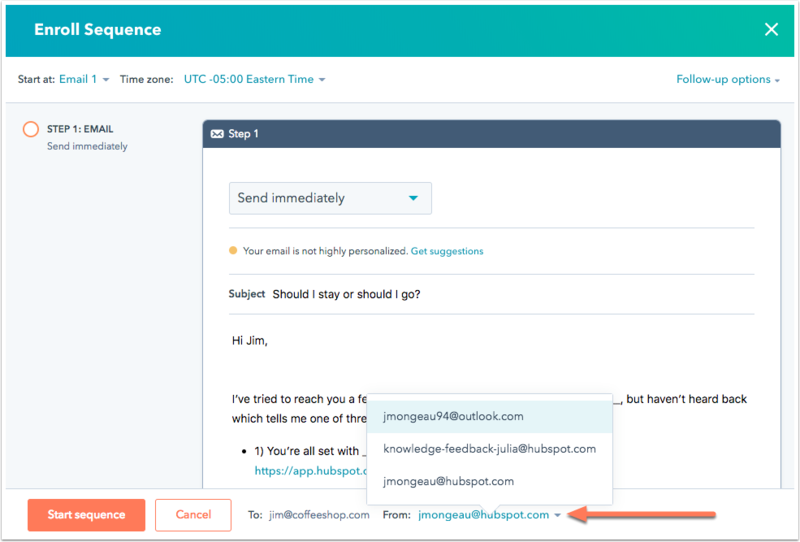 If you have multiple inboxes connected to HubSpot, at the bottom of the Enroll Sequence dialog box, click the From dropdown menu and select an email address to send sequence emails from. When you're ready to enroll the contact, click Start sequence. Click the name of the contact you want to enroll. In the left panel, click the Email icon email. In the pop-up box, click Sequences. In the dialog box, hover over the sequence you want to enroll the contact in and click Select. Send follow-ups at manually set time: specify a specific time for each email in your sequence. To manually set the send time, use the dropdown menus above each email in the sequence. Send follow-ups within a time range: use the dropdown menus to set a time range for each follow-up email to execute in the sequence. If you don't want the first email in the sequence to send immediately, click the dropdown menu above the first email and select Send first email at a specific time, then click the dropdown menus to pick a date and time. 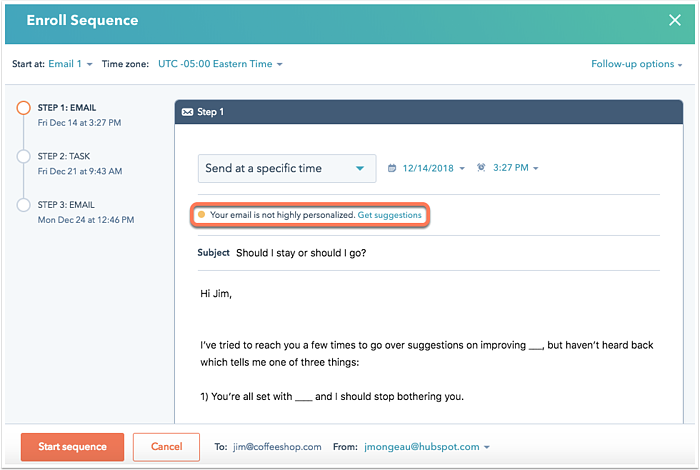 If you have multiple inboxes connected to HubSpot, click the From dropdown menu and select an email address to send sequence emails from. Learn how to enroll contacts in sequences from your inbox using the HubSpot Sales Chrome extension, the HubSpot Sales Outlook desktop add-in, or the HubSpot Sales Office 365 add-in. After enrolling your contacts, monitor and edit your active sequences. You can also analyze your sequence's performance over time to ensure you're seeing a successful number of replies and meetings booked. 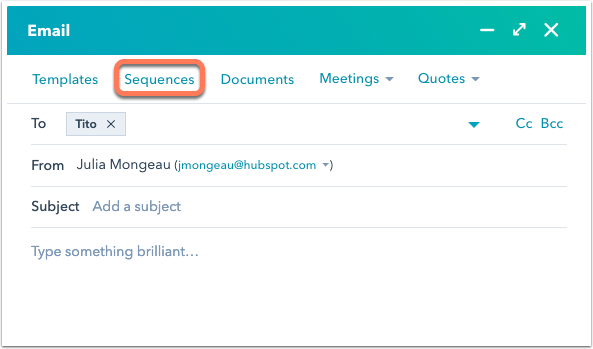 At this time, HubSpot will not restrict your sequence sending capabilities if your sequence bounce rate is high, but there are some general best practices to follow when using sequences. Create saved filters of unengaged contacts and to identify which contacts are not likely to engage with your sequence emails. Remove contacts that have hard bounced from your account. Don't send to contacts who have asked you not to contact them. Make sure your contacts' email addresses come from verified sources, and that these contacts have opted in to receiving email communication from you. Use personalization tokens in your sales email templates to increase engagement.